Today also marks the 191st birthday of Queen Victoria. 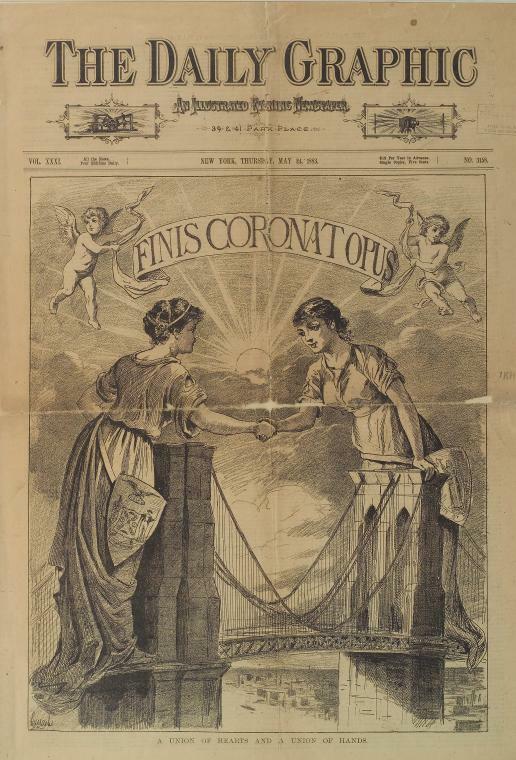 And back in 1883 when the bridge opened, this conjunction of dates proved to be a problem. 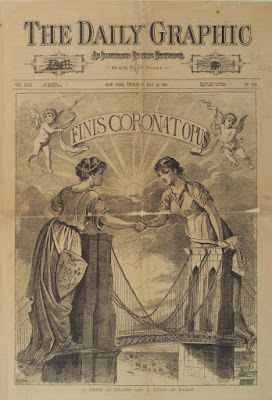 Many of the thousands of workers who constructed the bridge between 1869 and 1883 were Irish and they had no great love for the queen. Victoria's ministers were seen as having obstructed aid to the Irish during the great potato famine (which began in 1845) and rumors circulated that the queen had donated only £5 to the Irish -- and on the same day she'd given the same amount to a dog shelter. That wasn't true, but it didn't matter much to New York's large Irish population, who tried to persuade the city to postpone the bridge's opening ceremonies to a different day. The city refused but then began to worry that the bridge workers would cause a disturbance and had to pay for extra police to quell any possible riots. The grand opening -- an elaborate ceremony that included President Chester A. Arthur, Governor Grover Cleveland, and the mayors of New York and Brooklyn (then still independent cities) -- went smoothly with no violence. Indeed, the biggest problem came a week later when a throng of pedestrians (who had paid a penny each to cross the span) got scared and cried out that the bridge was collapsing, In the ensuing melee, a dozen people were trampled to death. Today marks the 115th anniversary of the unveiling of the marble memorial arch in Washington Square. 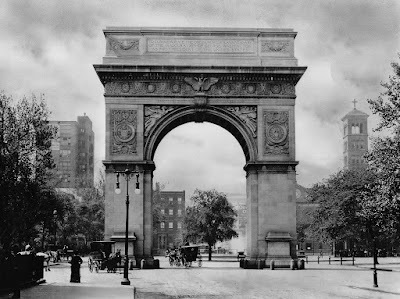 Designed by famed architect Stanford White, the arch was built between 1890-1892, making it the first significant edifice in the city's Beaux Arts period. White actually built the arch twice. The first one was made of wood, plaster, and papier-mâché and erected on Fifth Avenue just north of Washington Square in 1889 as a part of the festivities in honor of the centennial of George Washington's inaugural. (The Washington centennial was one of the largest parties New York had ever thrown. Its massive parade not only featured President Benjamin Harrison but also former presidents Cleveland and Arthur and every governor of the 22 states then in the Union.) As soon as the centennial festivities were over, a fundraising committee was established to create a permanent, marble replacement. Though construction of the arch proceeded quickly -- it was certainly complete by the Christopher Columbus quadricentennial in October 1892 -- the official unveiling did not take place until May 4, 1895. A huge crowd gathered to watch the military and New York's governor (former Vice President Levi P. Morton) parade down Fifth Avenue to the arch; the New York Times exclaimed that "a more orderly, courteous, and intelligent gathering of people has never been seen in New-York City than that which occupied the sidewalks of Fifth Avenue yesterday." "The adornment of courtrooms and public buildings with paintings and statuary keeps before the poorest and most indifferent citizens several things which cannot be too frequently presented to their eyes. One is that New-York is a great city with an illustrious past, a city to be loved, taken pride in, and guarded from despoilers from within and without. Another is that New-York contains many thousands of people who are not blind to the higher needs of the mass of citizens less energetic or less fortunate than themselves. The bitterness of poverty and disappointment is sweetened a little by signs of interest in, signs of respect for, the great mass of toilers." So, head on down to Washington Square today to look at White's magnificent monument -- and show respect for the great mass of toilers -- and celebrate the beginning of Beaux Arts New York.